There is a long standing "problem" between Outlook and Internet email - Outlook uses a proprietary email format that only Outlook and Exchange (and a few other clients, including gmail) can decipher. When the recipient doesn't use Outlook, they get a plain text message and an attachment named winmail.dat. Additionally, the attachment icon may be hidden by some clients, including OE and Windows Mail, making it look like the attachment was removed. Note that if you are using Exchange Server, the Exchange administrators can disable RTF on messages sent to the Internet. SharePoint Contacts linked to Outlook are also a problem. See Other causes of unexpected formatting for more information. If you arrived on this page because you received a winmail.dat attachment and don't use Outlook, see the Tools below for utilities you can use to retrieve attachments from the winmail.dat file. Don't bother looking in winmail.dat files if you were not expecting an attachment (or if the message size indicates there probably is not an attachment). 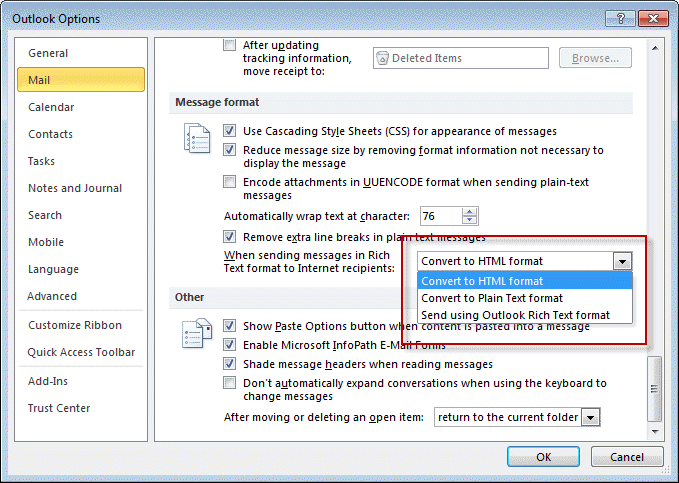 Or ask the Outlook user to resend the file, using plain text format. If there is an attachment in the winmail.dat, asking for a resend is my preference, in most cases. This way the sender fixes the problem for future attachments. If you aren't expecting an attachment and the file size is too small for an attachment, you don't need to ask for a resend, you are only missing the pretty formatting. Don't forget to clear the auto-complete cache after changing Outlook's settings. The auto-complete cache (nickname cache) remembers the setting and Outlook will continue to send messages using RTF. Delete the address from the cache to clear it or clear the entire auto-complete cache. See How to clear name from the cache at Understanding Outlook’s Auto-Complete Cache if you need help clearing the autocomplete cache. Recommended setting for most contacts: Let Outlook decide. This will send all messages using the global properties. If you need to send Meeting Requests or other messages that require TNEF encoding and know the contact uses Outlook, you can set the contact to always use RTF. Double click on the address in the To field. If the address is in your Contacts folder, their contact opens; if the address is not in your Contacts, the email properties dialog opens. Use this setting to "one-off" the formatting when sending meeting requests or RTF formatted messages to Internet addresses. This will override the setting in Options dialog's Internet options. 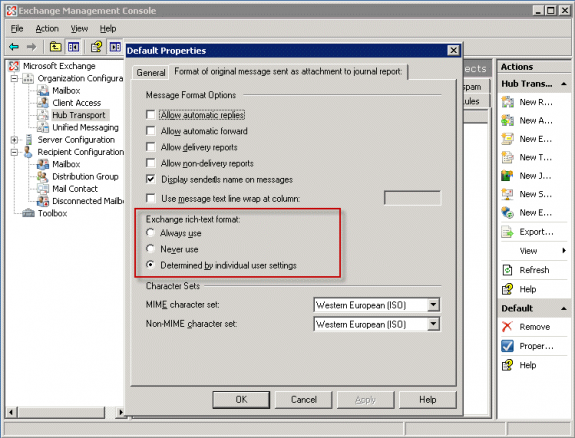 Recommended setting: Let Outlook decide - this will send all messages using the global properties. If you need to send Meeting Requests or other TNEF encoded messages and know the contact uses Outlook, you can set the address to always use RTF. 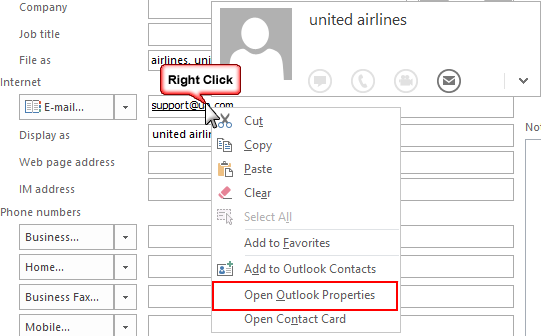 Look for Open Outlook Properties on the context menu when you right click on the email address in an open contact. Note that you need to be really fast and right click before the hovercard comes up. Once the hovercard comes up, the Properties link is missing from the context menu, often until you restart Outlook. For more information about these settings, see Use Outlook's Contacts, not Contact Cards. In Outlook 2010 and newer you'll access the email properties from the contact card that comes up when you hover over or click on an address in a Contact or an email message. Select the menu icon on the right and then Outlook properties to open the Email Properties dialog. As with the older versions, the recommended setting is Let Outlook decide unless you need to force RTF. SharePoint Contact libraries synced with Outlook are marked to always use RTF. This is fixed in Outlook 2010 SP1 or the Exchange administrator can configure Remote Domain transports for the domains that don't use Outlook and set them to never use RTF to get around the problem. To change the settings on Exchange server, open the Exchange Management Console, expand Organizational Configuration, Hub Transport, Remote Domains, open default transport (or the transport you want to change, if you have more than one) and change the Rich Text setting. See Configuring TNEF settings on Exchange Server for the PowerShell cmdlets to use and instructions for configuring it in Office 365 Exchange. Antivirus scanning corrupts the TNEF attachment and the recipients Outlook can't decode it. This is more common with client side scanners, such as AVG. To fix, disable email scanning on the client side; there is no need to scan email with a virus scanner on the desktop computer. As mentioned previously, the nickname cache can contain the 'always use RTF' flag - if the sender ever forces RTF for one message to the contact, the cache remembers the setting for that contact and always uses RTF (forcing it on the address overrides the conversion setting in Mail format>Internet), even though the contact is no longer set to always use RTF. Delete the address from the cache to fix. If you don't want to make the changes to the registry yourself, you can download a .reg file with the changes. Double click to install. Remember to restart Outlook or reboot if the registry key does not appear to work! To reverse the changes, delete the key from the registry or edit the .reg file in Notepad and change the following line, then save and run it. (I went) one step further by clearing the whole auto-complete cache of Outlook. 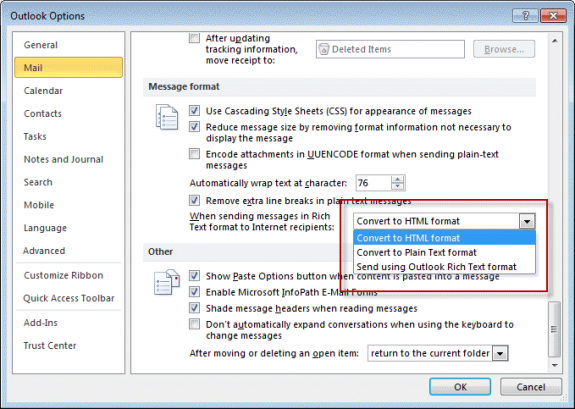 Outlook > File -> Options -> Mail -> Send Messages section. Click the "Empty Auto-Complete Lists" which will clear the entire cache and it finally worked. I added the registry word as instructed, cleared the auto-complete cache as suggested several days ago but files I send to a non-outlook recipient are still showing up as winmail.dat. I cannot continue my business correspondence this way. Many of my customer have Mac. Microsoft please fix this or I will have to switch from Outlook. I started having the issue several months ago after a recent automatic update of outlook 365.I don't have time to mess with this and my customers are annoyed. Can anyone from Microsoft tell me why this has not been fixed after several years? Which version of Outlook do you use? Did you download and run a reg file or edit the registry? If you edited it, try the reg file. 1) I don't have "Outlook Properties" in the contacts. Even the Microsoft support page says there is no per-user option in Outlook 2013. Yeah, Microsoft basically broke the Outlook properties - but if you set the LegacyGal key, you'll see the properties dialog. On #2, was your address in autocomplete? If so, try deleting the autocomplete entry and resending. So changing the setting to keep RTF formatting fixed it? That is normally the cause of the problem. You saved my life, thank you very much. The method with Registry Editor is perfect. else on both sides of the company were able to send emails and attachments without any issues. et voila, the email was received normally. This seems to have just started again in the last month, perhaps with the new update that came out. I cleared all cache, added the registry item, and still my brother on BTopenworld is getting winmail.dat. Really is frustrating that MS don't just drop the TNEF and be compatible with everyone. 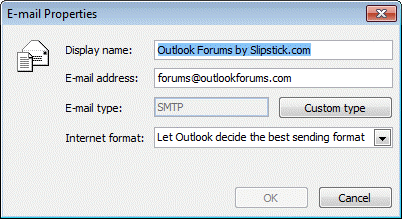 this is a known issue - https://www.slipstick.com/outlookcom/outlook-com-winmail-dat-bug/ - and will be fixed in an upcoming update (expected in the next month or so). That would indeed be wonderful if it were fixed. Like others, I follow the suggestions, clear the cache, get to a clean state, then .... WHAM it starts all over again. Very frustrating. I cannot depend on anything getting through to a recipient. not Outlook.com. You have stated this incorrectly in several of your pages. I have many clients that HAD this problem with The Suite, but not with Outlook.com. they are two different issues - yes, you can send winmail.dat with any version and there are things you can do to avoid the problem - from using html or plain text format to settings a registry key to block rtf format (which is the cause of winmail.dat). There is a bug found only in outlook.com and none of the usual fixes prevent the winmail.dat - plain text doesn't help, setting the registry key doesn't help. This page references the general problem that has existed for years- the page linked in the red box applies to the outlook.com issue.